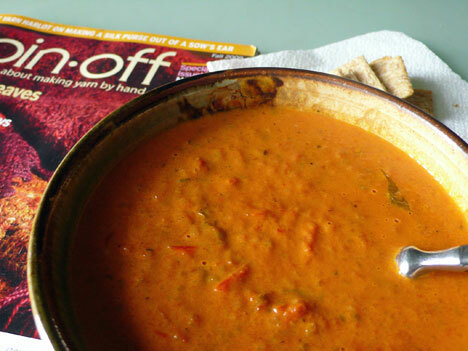 for lunch yesterday, one last bowl of the tomato soup i made a week ago, so good and warm. just the right thing to go with some good reading . 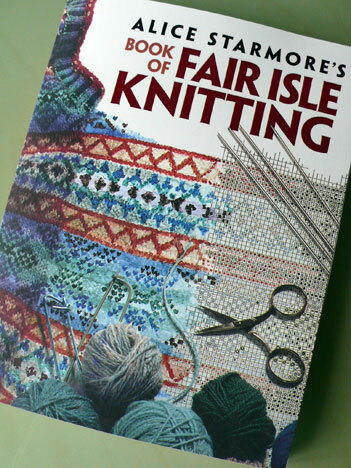 . .
tuesday’s mail brought me a copy of alice starmore’s book of fair isle knitting, first published by taunton press in 1988 and recently re-released in paperback by dover press. this has long been one of my favorite knitting books—i purchased a hardcover copy back in the early 90s on remainder and practically wore it out, scouring the pages for insight into combining patterns and colors in textiles. i learned a great deal from this book about putting my mind and my skills to work to take my knitting to another level. my favorite aspect of the book is the photographic juxtaposition of environmental patterns and their translation into knitted color patterns. as a painter, i was able to appreciate and relate to starmore’s explanation of how to channel inspiration into textile surfaces. 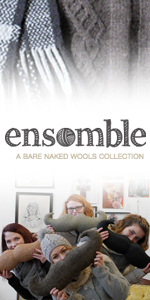 my vision about what was possible in knitting was opened wide. i’d been encouraged before by clothing designers i worked with to “do something with your knitting”, but didn’t know how to start, and being non-knitters, they didn’t know how to help me. 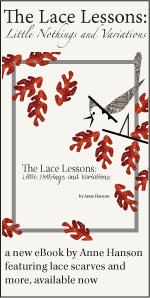 the book started me in the right direction—because i possessed established skills and experience (both in knitting and garment construction), and a good vocabulary of stitches and techniques, i had confidence about approaching my knitting in a different way, once i was pushed to see how. i’m not saying that the book gives step-by-step instructions to accomplishing a great mental leap—that’s a really personal process—but that for me, it offered an example for using my mind and skills in a way i hadn’t yet, at least not with textiles. though i have yet to knit a fair isle sweater, the book inspired me to spent a good deal of time swatching color patterns as well as lace, cables, and knit/purl motifs to understand how the elements of scale, color, negative/positive, texture, etc, can be used to express ideas and inspiration AND be visually/universally pleasing AND work mathematically within the structure of a garment. 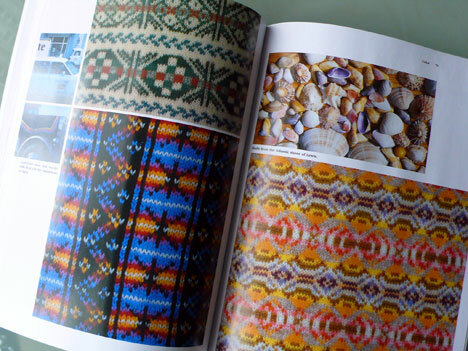 in addition to the section about design inspiration and translation of visual imagery, the book offers concrete information on pattern geometry and mapping, a library of motifs, sections on techniques for fair isle stitchwork and garment construction, as well as historical background on the practical and aesthetic aspects of fair isle garments. 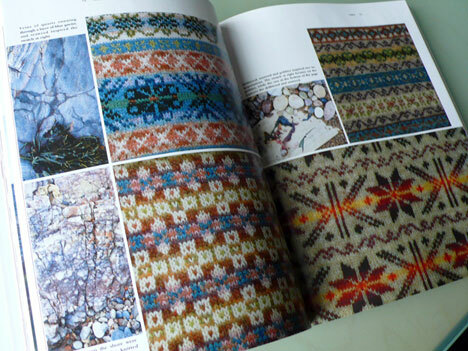 plus a beautiful section of patterns for fair isle sweaters, for those that do not wish to design their own. whenever i am asked to recommend a book about designing, i point to this one; i’m so glad that it is once again available to everyone—and at a reasonable price. one day, i will knit one of these incredible sweaters for myself—it will most likely be my version of “wearing purple”. on the other hand, i should probably tackle that project before my eyes get to be anywhere near that age . 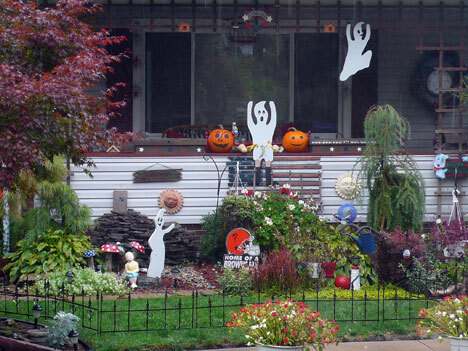 . .
despite the cold and rain, our neighbor has begun the process of getting his house ready for halloween. the ramp-up toward the holiday has begun in earnest—i can’t wait tos ee what he does this year. well, i thought i had a ton of other stuff to talk about, but now i’m not sure . 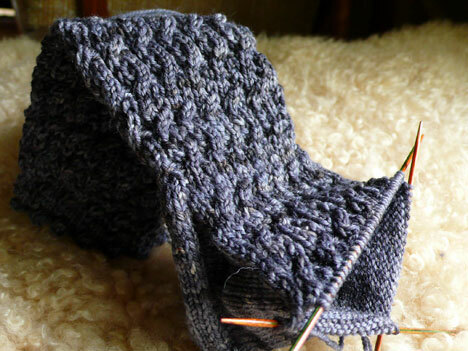 . .
roxanne has updated the zen yarn garden shop and added some of this yummy squooshy yarn, which is what i’m knitting these gray socks with in the silver moon colorway. for some reason, my sock knitting has been going very slowly—well, i know why, but i wish i could get it together; sock weather is upon us now and i’m going to need a few more pair for gifting in just a little while. 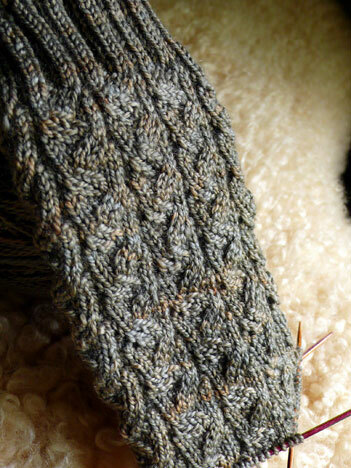 i’m still working on this first cabled sock, but not often enough. must get busy. my brown sock is growing at about the same snail’s pace. i really must get back to making socks my regular late-night knitting or they just don’t get done. last evening i went to debby’s to knit and we both worked on neckwarmers—she’s test knitting hers in a solid color and it’s amazing. i didn’t have a camera with me to take a photo, but i’ll be sure to get one on monday when i see her. we worked through a few last kinks in the pattern and now i think it’s all good. carissa is knitting one too, so she’ll tell us if we missed anything. 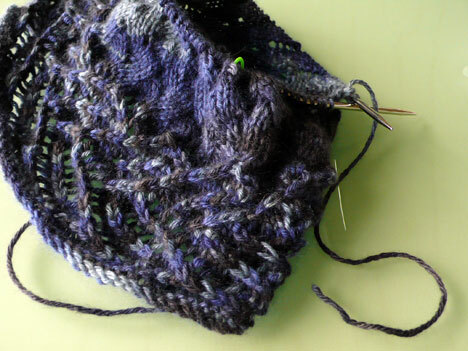 my second one was tooling along nicely until i did, indeed run out of yarn. drat. i’m going to set this one aside just the way it is and hope that someone decides to make one in the same colorway, and might be willing to sell me their remainder yarn. i moved on to another project and got sorta sidetracked in the usual beginning tangles. i had to rip and re-cast on a few times, then decided to make a change, so ripped again . . . that sort of thing. i thought i’d have time to get some work done on my green sweater, but no. still, a very nice evening of knitting. and you can’t beat the company. on a completely other note, my bianchi flies once again. you remember i got a new bike about a month or so ago? well, after riding it for a while i was experiencing pain in my back and knees, probably caused by a poor fit—i’m freakishly high-waisted, which creates problems in finding a bike. this one just isn’t right for me. i feel terrible because it’s brand new, but i decided not to keep it—might as well sell it while it IS still new. and it will be right for somebody else. i went back to the bianchi and it feels so much better. plus, it’s way cuter, hahaha. 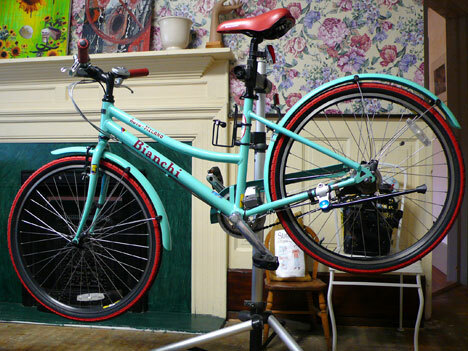 LOVE your Bianchi – aqua and red! Whoohoo! That’s cool. That is a SWEET bike!! I love all these toasty cozy goodies, including the soup. It’s lunch time here, and that soup looks scrumptious! Loving both those socks and that neckwarmer…it’s that time of year to bring out the woolies!! Gee, the photo in yesterday’s post of the variously hued tomatoes on the multi-colour striped towel sure look like inspiration for a Fair Isle piece to me…Another excellent resource on this topic is Anne Feitelson’s book, by the way – I especially like her section on colour theory, although you probably don’t need that part! MMM I am having tomato soup for lunch today …topped with Goat Cheese. oh de lally. mine, is not made by me but it IS freshly made..but I am positive yours is BETTER! If I had a bike, and we had a bike trailer for our tot…we could take cruises…but alas, I do not…some day. I did some of my own hand spinning, back to some fine yarn…so far so good….I am just getting some nerve up to try that dang wheel again. Thanks for the nudge! Appreciate it. Lovin’ those brown socks, and the neckwarmer. It’s getting chilly here in MD too, so we are all thinking about warm stuff! Yes please – get those socks done (lol). I always said I would never pay for a sock pattern that wasn’t part of a book – I think to date I have purchased at least 6 or 8 of your sock patterns and I LOVE THEM! Anxiously waiting for more. Thanks for your hard work in putting these together! I for one am glad that you did “do something with your knitting”! Your knits (and veggies) are always an inspiration, not just for knitting but for creating beauty in living. I really love your brown sock – it looks like my kind of sock! I just got this book this past weekend as a (heavily hinted at) birthday gift! I LOOOOOOOVE it. I had read a bit about Alice Starmore and seen versions of her designs on ravelry, but what an eye opener the book is! I love th pictures of real-life objects, like beads, transcribed into color patterns. I am completely fascinated. That soup made my stomach growl. I have a cold and haven’t been hungry, but that looks really appealing. That very book recently fell through my mail slot. I am precariously perched on the edge of fair isle peering down into the deep, deep hole. I have a skein of the FF Anne colorway in the sport-weight cashmere also. You are welcome to 25 yards of mine if you need it. (I see you got another offer for some). Let me know and I can wrap off part of the skein and put it in the mail to you. Thanks for the comments about Alice’s book, I have been on the fence about buying it, now I think I will get it. I think you can take your bike to a good bike store and get it fitted for yourself. Most good stores will make sure you get the right fit. Wow that book looks amazing!!! I’ve never had a chance to see it myself, but wow. That book looks unbelievable, I’ll have to get my hands on a copy as soon as possible. I’ve been wanting to design a fair isle sweater for myself lately, and maybe this’ll get me headed in the right direction. I’m liking those cabled socks. I lost my job a couple weeks ago and a friend brought me some purple sock yarn to help me feel better. The yarn would look lovely in that pattern. I just placed an order for the Starmore book and can not wait to get my hot lil’ hands on it. Her work is amazing. Thanks for the recommendation on the book. I love it when the bloggers I read show new/re-released books that are off the beaten path. Starmore’s stuff is amazing. I wish they’d reprint Aran Knitting though!